The People's Liberation Army must build itself by innovating in every respect, President Xi Jinping said on Sunday. Xi, also chairman of the Central Military Commission, told national lawmakers from the PLA during a panel discussion that the capability to innovate is one of the key factors that will determine the Chinese military's future. He urged top PLA officers to "emancipate their minds" and to embrace new ideas and methods. The president said the next five years will be crucial for the development of national defense and for the PLA in building its overall ability through innovation. He did not elaborate. He also urged the PLA to improve its military theories to ensure that they better guide the military's growth. Xi stressed that cutting-edge military technologies have strategic significance, ordering the military to select key fields for research and development. He asked the PLA to achieve superiority in important scientific and technological fields and to better transform research results into practical use. 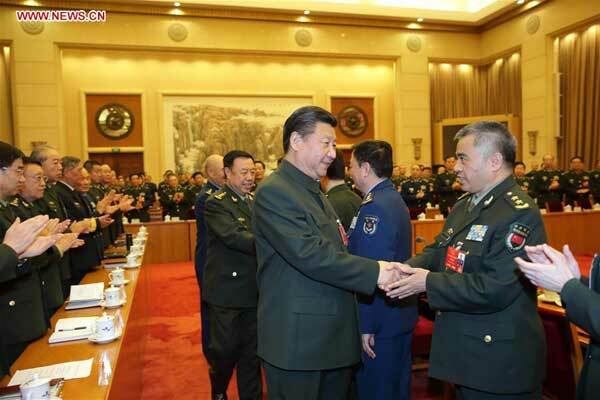 Xi told top military officers to upgrade their managerial abilities to make the PLA more professional and efficient. A military expert in Beijing, who declined to be named, said, "The ongoing reform of the PLA has entered a stage where many existing policies can no longer match reality, while some old training methods have even begun to hinder the PLA's development. "Every major military power in the world is overhauling its military theories, upgrading equipment and rearranging ... each of its services. "Therefore, only by reform and innovation can the PLA keep pace with them and surpass them in the future." Hua Ming, deputy commander of a submarine flotilla, said the PLA Navy now asks for all exercises to match real combat situations and also focuses on improving combat capability. He said the drills he took part in during the past year had been more sophisticated than those conducted previously.